are a great add on to any trade show display. 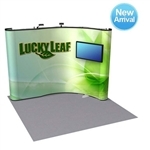 Monitor stands give your trade show booth a sophisticated look and feel. They offer a physical connection to exhibitors whether they want to browse through your iPad to see what your brand or company is about, or looking at your monitor scroll. Maybe you want to showcase past or future work/accomplishments achieved or that you plan to achieve. Monitor stands really bring your booth to life with a interactive experience that really draw a crowd. To get more information on monitor stands, contact our helpful staff by phone at 1-866-577-DEAL (3325) or by email at sales@exhibitDEAL.com.